A small budget, regional film made by amateur cast and crew decades ago is India’s only contribution to BBC’s 100 best foreign-language films list. Pather Panchali’s groundbreaking success is a recognition to the undaunted endeavour of art house creators around the world. The BBC has published a list containing the oeuvres of celebrated directors around the world in several languages except English. French films dominated the list occupying 27 places, followed by 12 Mandarin films, 11 Japanese films and 11 Italian films. The only Indian entry into the list is ‘Pather Panchali’ (Song of the Little Road) by Satyajit Ray which was released in 1955 and is placed at number 15 on the list. More than 200 critics from 43 countries were part of the selection process. Made on a shoestring budget, the film Pather Panchali is based on a novel written by Bibhutibhushan Bandyopadhyay of the same name. The film featured mostly new faces and operated by amateur crews. The shooting went on for three years due to cash crunch and at some point, Ray had to sell his life insurance and pawn his wife’s jewellery to resume shooting. The film first premiered in New York’s Museum of Modern Art on 1955 and afterwards it went on to garner critical accolade at various national and international award ceremonies. On his visit to London, Ray watched Bicycle Thieves by Vittorio De Sica in 1950 and he was immensely influenced by the neo-realistic approach of the director. 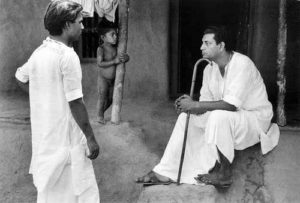 Pather Panchali was the outcome of Ray’s enthrallment towards realism. The story of the film revolves around the middle-class family set in rural Bengal during 19th century. The protagonist Apu and his elder sister are the children of Sarbojaya and Harihar. Harihar tries to make end meets by working as a priest. The film goes on narrating the childhood of Apu and Durga. The distinctive features of the movie are its humane treatment of characters, natural acting, attention to details and the sensual usage of nature as a backdrop at a time when these things were unheard of in the arena of Indian films. Ray was one of the pioneers in the parallel film movement in India along with Mrinal Sen and Ritwik Ghatak. Pather Panchali was the commencement of that genre. Apart from the unconventional artistic narrative of the film what still entices the audience to this day is the exquisite portrayal of mundane life on screen. The film is laden with numerous scenes that will tug at the heartstrings. The wrangle between Sarbojoya and her sister-in-law Indir, Apu and Durga’s banter and their playful escapades, all have been loyal to the author who penned the novel. The time when as trivial event as rain was descending on the small hamlet of Nischindipur, the first droplet of water, the wafting of wild flowers in the gusty wind came ever-so-alive to the audiences through Ray’s impeccable visualisation. The movie received its fair share of negative response accusing Ray of selling poverty on silver screen. But the pragmatism that is required to tell a story with integrity doesn’t give a free pass to any bitter truth. That is palpable in other works of Ray too. Later in his life, Ray went on painting stark image of live dealing with topics like religious dogmatism, urban hypocrisy and women empowerment. The farsightedness and the rigorousness of his commitment towards art garnered Satyajit Ray a place among the best directors of all times and introduced Indian cinema in a different light through Pather Panchali.